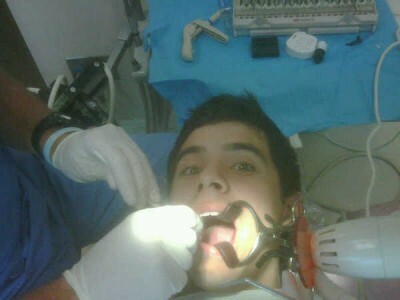 David Archuleta’s picture of himself having his wisdom teeth extracted is one of five finalists! How cute! Congratulations! Your photo has to win! Photos shared publicly on social media sites can bring us behind the scenes and to the front lines in an immediate, unprecedented way. For the first time, the Shorty Awards will recognize the Real-Time Photo of the Year. Five finalists were chosen from your nominations. They are photos taken in 2009, shot from a camera phone, and uploaded to a site such as Twitpic, Yfrog, Tweetphoto, Facebook, and Flickr. These images are currently being judged by the Academy on how interesting and newsworthy they are, and how well they make use of the real-time nature of the medium. The winner will be announced at the Shorty Awards ceremony in New York City at the TimesCenter on March 3. Get details and purchase tickets here. David Archuleta is so down to earth it’s unreal. Many have asked, “Is he For Real?” Yep! David not only invites us into the dental chair with him but he’s basic and down to earth enough to say he has mice in his drawer at home. David treats his fans just like family. We lol, cry, pray, eat, whatever…we do things together because he invites us into his humility. And we eat it up. We love him and he loves us. It’s a very symbiotic relationship indeed. Being David’s fan is more like being his brother, sister, mom, dad, best friend. It’s Great!